The last few years I have been working my way through a ton of different project management tools – everything from paid to free. I will here go through two of my favourites. One of them is paid, the other is free. Monday (formerly DaPulse) is a paid project management tool. This is definitely the one with most options and the best solution if you are a medium sized or large company with som $$ to spend. Most of Monday is drag&drop – meaning tasks, folders and projects can be drag&dropped to different destinations. I caught myself often thinking “I would like to do this” and right there is the option for exactly that. This tells me that the people behind Monday knows their project managing. If you want Gantt view you have to upgrade from Basic to Standard. Their Facebook group and “Monday labs” for testing new features are also good reasons itself to join this community. Monday does not have any free option or solution for a one man band (freelancer) which will mean that it’s too expensive for many. 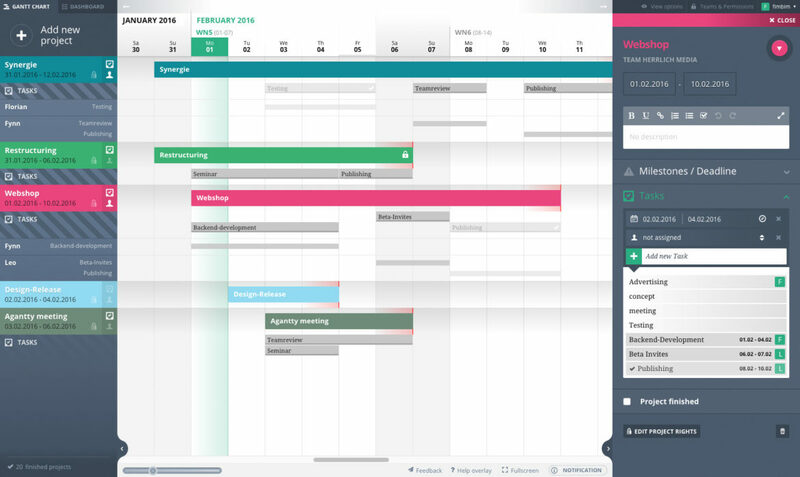 Agantty is a free project management tool with Gantt view. When i discovered this tool my first thought was “finally!” This is a simple but not simple project managing tool working exactly like it should. It’s easy to add projects in the main window, you immediately see it in the Gantt view with with dates above. The view can be zoomed in, and with a mac mouse you scroll to left or right by moving in that direction on the mouse. Click on a project and you will get more options. if you want to change the dates, just drag the project in the Gantt view, no need to add new dates manually. You miss some features found in Monday, but still.. this works exactly like it should. Only problem I’ve had so far is the sync between the Chrome extension and web-version, so I will stay with the in browser version.